Tim Day presented creative new ways for Christians across Canada to work together. Tim Day presented a similar vision – on steroids – and it was music to my ears. 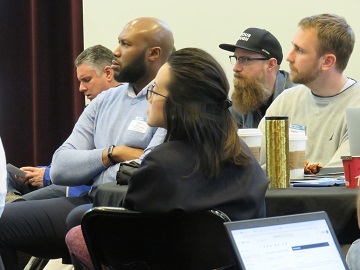 Day and his Insights to Impact Tour team spent a couple of hours with 75 or so pastors and ministry leaders at Tenth Church yesterday (April 3) and will be making a similar presentation April 4 at Christian Life Assembly in Langley. He asked those gathered at Tenth to think with him, “What does Vancouver look like 10 years from now, as we do ministry together?” He began by considering the Canada-wide picture, then the local scene, then presented a proposal for future cooperative efforts. Day asked the group to guess how many Christian organizations there are across Canada and how much is donated each year. Answers varied widely, illustrating his point that people just aren’t aware of that kind of information. The point is that there are a tremendous number of Christians organizations – more than 30,000 – which each year receive more than $5 billion in donations, have more than $14 billion in revenue (including donations) and own more than $38 billion in assets. 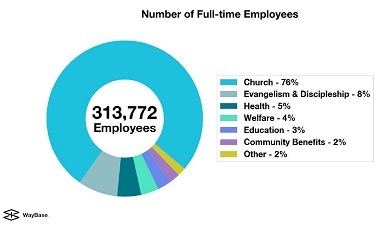 These organizations have 313,772 full-time employees. “We crush Tim Horton’s” and other cross-Canada giants, he joked, in terms of numbers and distribution. 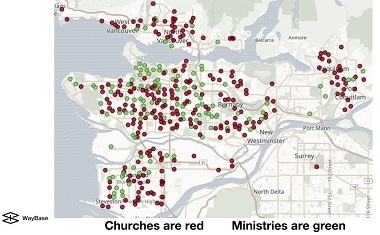 Turning to Vancouver, Richmond and Burnaby (each stop focuses on one or more cities, with the next one looking at Surrey, Langley and Abbotsford), Day said there are 3,895 employees in more than 920 Christian organizations, with more than $238 million in donations and $579 million in revenue. He said we are particularly strong on the provision of welfare, health and education in this area. We in the church “are mobilizing thousands and thousands of people” across Canada, he said, and many of them are volunteers who don’t need to be paid. Local governments are increasingly realizing that they need to seek out our help, because we are doing things they cannot. Participants seemed keen on the message. We have featured the Halo Impact several times in Church for Vancouver. 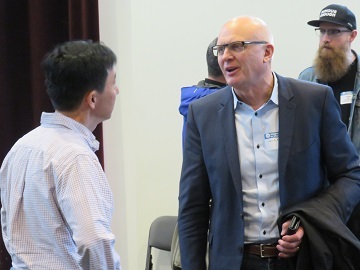 I happened to catch the eye of Trevor Vanderveen, pastor of First Christian Reformed Church of Vancouver as Day spoke. Ken Shigematsu, senior pastor of Tenth Church, speaking with Dave Koop, senior pastor of Coastal Church. 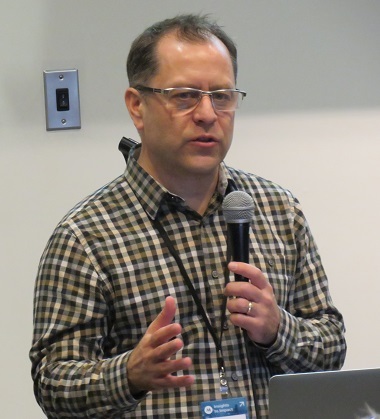 It was also good to hear Day refer to Milton Friesen’s work with Cardus on the Halo Project, because it demonstrates that he is working with some good partners and is not hesitant to name them. The Insights to Impact Tour is sponsored by City Movement (of which Day is executive director), partnering with several big players in the Canadian Christian world: Alpha Canada, the Global Leadership Summit, Ending Poverty Together, Canadian Council of Christian Charities, the Evangelical Fellowship of Canada, Youth Unlimited, Young Life, Power to Change, Catholic Christian Outreach, FaithTech, InterVarsity, Navigators and Silent Partner Software. Representatives of the first three made brief presentations during the gathering. Day says one purpose of the Insights to Impact Tour is to allow ministry leaders the opportunity for input as the WayBase site is being built. Jonathan Mitchell, right, with Tim Gonsalves, Alpha for Youth national director. Day began his presentation by pointing out that the genesis of the Insights to Impact Tour and WayBase drew from new insights about the changing nature of the church, particularly related to young people. As he undertook a ‘year of 150 coffees’ three or four years ago, meeting with leaders across Canada and the United States, he heard again and again that ‘young people are less involved’ and ‘we don’t have enough young leaders.’ Studies have borne out that reality, and there grew a sense that there had to be a new way to work together. 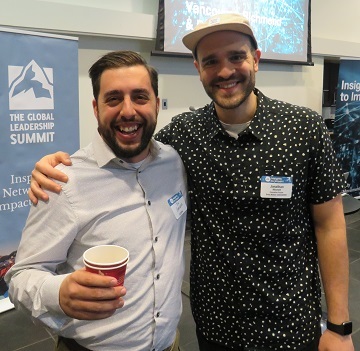 Jonathan Mitchell, who founded the Chapel Movement and now works with Multiply, linking youth pastors in the 604 Network, has been involved with City Movement for a couple of years. He was part of their 2016 Millennial Think Tank. 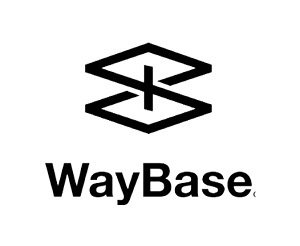 I was deeply encouraged by the level of ingenuity being applied to the future of the church by the WayBase team. It’s very apparent to me that the Holy Spirit is moving the church into increased levels of cooperation and unity. Tools like this are becoming increasingly essential as the value of kingdom initiatives is recognized by more and more Christian organizations. My prayer is that WayBase will provide valuable information to those already working together and pave the way for more organizations as the value of unified efforts is more easily seen and reported on. One key partner on Day’s team is James Kelly, founder and director of FaithTech, “a growing movement of Christians interested in all things faith and technology.” He also took part in the Millennial Think Tank. Several student ministries have key roles with City Movement / Insights to Impact / WayBase. Tim Day and Ken Shigematsu. 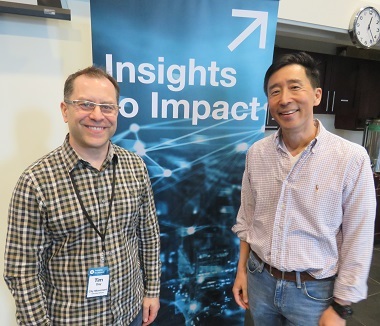 Those I spoke with arrived curious to discover what the Insights to Impact Tour was all about – and maybe a little hesitant about whether ‘outsiders’ would be of much help here. I only heard positive responses following the event, though with some remaining uncertainty about how it will all be fleshed out. Day did stress that the whole thing is a work in progress, and to that end asked those gathered to consider participating. I suspect that many will. ← Around Town: Business as Mission, Bill C-262, Cherry Docs, Alzheimer Café . . .
Great review, Flyn! We are encouraged to see this taking place. UGM will participate!